I have been involved with horses for many years in the UK where I grew up. Then in 1987, I moved to S.A. where I carried on working with horses and caring for them. Becoming a massage therapist in 2003. 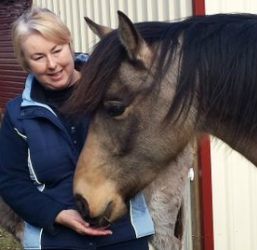 In 2009 I move to the Huon Valley in Tasmania with a mission to help and heal horses physically and emotionally when possible. This has been an amazing journey of love and learning which I am still on! I gained my qualification with the National College of Tradional Medicene in Victoria. Also providing Canine Massage and Energy Healing.